Here are two pictures of my ice tube clock! You may use them however you would like. Ice Tube Clock with GPS. It works great! Amazing GPS sensitivity, even indoors. to keep it from being too bright. It's alive! I tried using HDR for the first time, to get a good brightness balance between the digits and the rest of the clock. The focus was too close to the front, though. I assembled my monochron last night. I was doing good until I installed the wrong resistor for R1. I used the R2 by accident. I compounded this by removing R7 by accident. Needless to say the first 45 minutes of assembly was a bit slow. Everything proceeded without a problem. The board went 'ping' as it should, the LED turned red as it should and LCD displayed Dali time as it should. Overall, this was a great project. I made a simple mod adding a mode to display Posix time in hex. 3d0g wrote: I made a simple mod adding a mode to display Posix time in hex. * 3. Display to insert the result in a comment after the selection. I must also say that the instructions were absolutely perfect to assemble the clock! 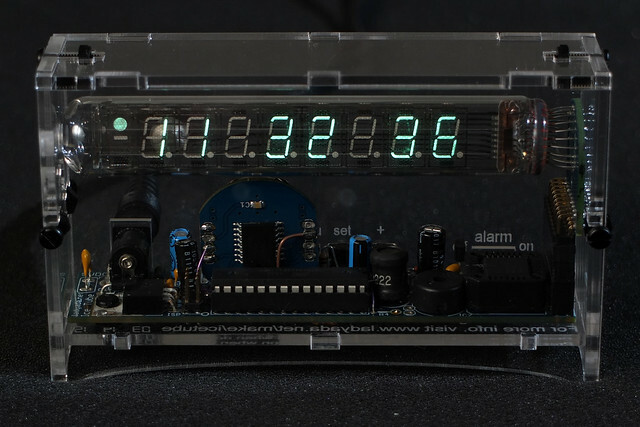 Kudos to you @ Adafruit! I can't believe the level of detail that went into this kit. The instructions and photographs were perfect for constructing the kit. Fun to build! Passed the smoke test first time it was plugged in. This is an elegant design and a very well organized kit. This was my first major solder work in about 30 years, and amazingly, it worked perfectly the first time. I'm sure that had more to do with the excellent instructions than my skill. I made it for my brother-in-law, and since it wasn't ready for Christmas (I was taking my time), I'll send it to him next month for his birthday. Or course, after going through the forums, now I have to tempt fate and add the dimming, DST, and calibration features. 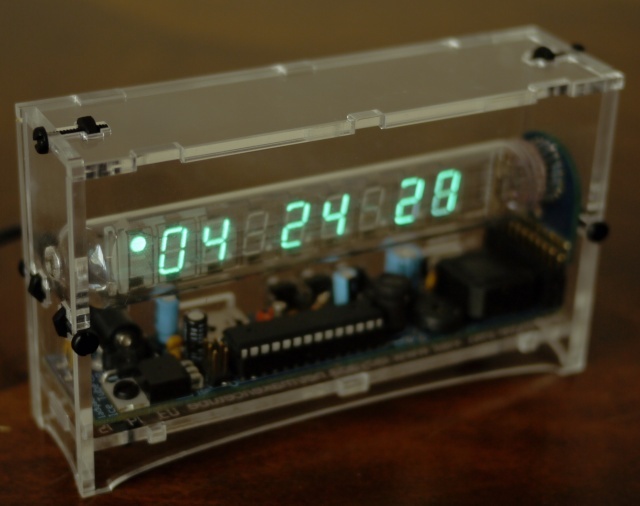 Ice Tube clock with ChronoDot for timebase and backup time maintenance. This is not one picture, but around 1000 pictures, forming a timelapse. It gets truly "dark and glowy" at around the 40 second mark. 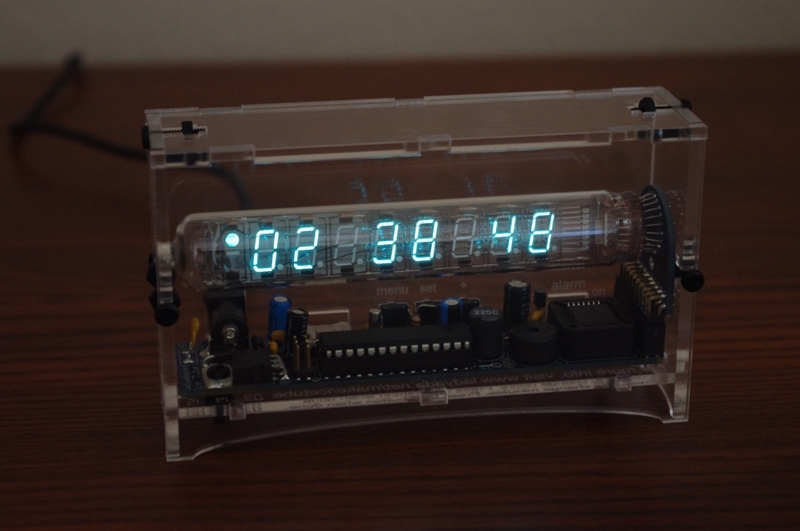 Here is a picture of an IceTube clock I built using clear screws for the case. In the background is a printed IceTube clock enclosure by Nathan Matsuda @ Thingiverse for a future project.